Editor's note: Rep. Jared Polis, a Democrat, represents Colorado's 2nd Congressional District and is appearing in CNN.com's "Freshman Year" series along with Rep. Jason Chaffetz, a Republican from Utah. 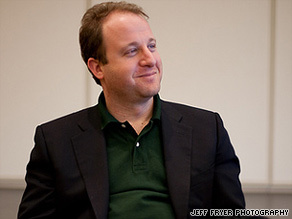 Jared Polis says expanding successful charter schools would be a major boost for education. (CNN) -- To be effective in Congress, you must focus. With so many issues and debates occurring at any given time, it is easy to spread yourself too thin and lose sight of your goal. Improving our nation's education system has long been the cornerstone of my policy agenda. Since I am so seldom in Colorado during the school week, I try to fit in as many school visits as I can during my district work periods. This past week, I managed six school visits during one day and visited two more schools on my trip to the mountains. Meeting students, teachers and parents is a welcome departure from Washington and the political realm. One of my main legislative efforts in education is to help expand and replicate successful charter schools. Charter schools are public schools with site-based governance. This means that rather than being run by a school district, charter schools are run by a board of parents and other community stakeholders and have a contract with a public authorizing entity, usually a school district or state, that sets their parameters of operation and performance expectations. Today, 4,618 charter schools educate over 1.4 million children in 40 states and the District of Columbia. The All-STAR Act would provide $500 million to enable successful charter schools to serve more kids by either adding seats, grades, or opening additional schools based on those same successful models. There are a lot of children in our country that, because of their neighborhood or socio-economic status, do not have the opportunity to attend a good school that will prepare them for life's challenges. Consider these facts: A minority student is four times more likely than a non-minority student to attend a high school with very low graduation rates (so-called "dropout factories") and three times less likely to attend a high school with very high graduation rates. High school students from families at the bottom 20 percent income group are six times more likely to drop out than students from higher-income families. Amid this landscape of desperation, charter schools often serve as lone, luminous beacons of hope. Before I came to Congress, I started and ran the New America School; a charter school that helps 16 to 21-year-old new immigrants learn English and earn a high school diploma. I saw the many problems facing our nation's public education system -- failing schools that forced many kids into lives of poverty and crime. I wanted to use my talents, as an innovator and entrepreneur, to create a new teaching format to catch these kids before they head down that dark path. The beauty of a public charter school lies in its great autonomy and self-determination -- this is what drew me to charter schools in the first place. In the 40 states and the District of Columbia that have charter school laws, anyone -- from entrepreneurs like myself to groups of parents -- can start a public school. But with an estimated 365,000 children on charter school waiting lists, the demand far outpaces the supply. In Colorado, we have 56,000 students in charter schools and more than 38,000 on waiting lists. Now just because I started a charter school doesn't mean I think charter schools are necessarily better than other public schools. In fact, without proper teachers, administration, and community support, they're just as likely to be worse. A good metaphor is that district-run public schools are like the big studio movies; produced according to a standard formula with a big budget and mainstream society in mind. Charter schools are like "indie" films. Some can be really amazing on a low-budget, and others are simply box-office duds. My bill would find those indies that work, and invest in their directors and producers to help them reach an even wider audience. The All-STAR Act won't instantly solve all the woes of public education. But it will make a big difference for the children who will be able to attend top-performing schools and society in general, by helping to break the pathway from failing schools to poverty. In our public education system there are many terrific schools. There are also a few mediocre schools and sadly some that "you wouldn't want to send your kid to." To reform our education system, rather than locking generations of students into the same old, failing schools, we ought to take a good look at our excellent schools, study their best practices and replicate their success. Some politicians believe there is a single silver bullet that will solve all of our problems in education, be it vouchers, merit pay, standardized testing, charter schools, a particular curriculum, or simply more resources. The jury is still out on this, but regardless of whether we ever discover such an educational panacea, my fear is that while we search for this single solution, generations of American children will fall through the cracks. In the meanwhile, this tried-and-true rule still applies: Stick with what works. That's what All-STAR does. Supporting successful charter schools helps kids, who by fate were born into areas with poor schools and who have no other alternatives, to attend better schools, go to college and succeed in life. The opinions expressed in this commentary are solely those of Jared Polis.